I almost didn't go to the durbar square which is a painful and exhausting 1800 steps up in the ridge overlooking the whole town. Living in Manila where the average elevation is 2 meters, it is undoubtedly an unbelievable task just to get up here. This day made me realize that if there's a will, there's a way. It all started with the lack of cash, and being located in the mountains. In Gorkha, a popular pilgrimage site for Hindus, good value accommodations are hard to find. Restaurants also serve basic staple and a couple of continental dishes. That's it. To say that Gorkha is one of the most off the beaten path destinations in Nepal is the truth. In my few days stay here, i've only seen two sets of tourists the whole time. And when all of them left, i think i'm the only one who's not from here. Since i didn't have anymore cash with me, negotiating the steps up is the only way to go. However, knowing my physical abilities, i knew that i could climb up but in 2-3 hours which is definitely not enough time, to cover the durbar square in daylight. Obviously, at this point, my hopes of seeing the infamous durbar square crashed in front of me. The Shah rulers have definitely made the durbar square quite a rigorous task for followers to visit. In a stroke of luck, the man who pointed me at a wrong direction, was right all along. Laughing for a bit because i have very limited cash, he said he can make do with 500 rupees. It is over my budget but i am not leaving Gorkha without visiting the durbar square. Never. So as the saying goes, if there's a will, there's a way. A few minutes later, the man whom i bought my cola earlier, came up to me with his motorcycle. And we we're off to the durbar square. The road going up the Gorkha durbar square is beautiful. The roads gently ascends to unfathomable curves, only with views of rice paddies below, and a couple of stone houses perched on the cliff. There were many pilgrims walking up from here. It seems you don't have to walk the cobbled steps anyway, as the path here is much more manageable. After a couple more steps, i have finally arrived at Gorkha Durbar Square.The palace/temple/complex is a fortress built by the king of the Shah dynasty. 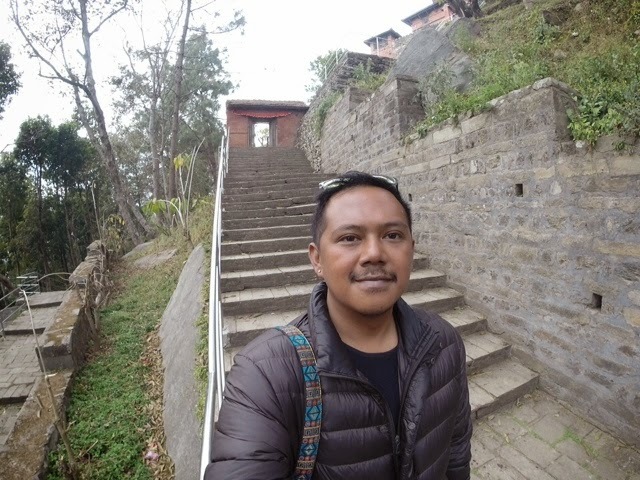 Gorkha is also the birthplace of King Prithvy Narayan Shah. The elaborate details of the entrances and archways were enough fuel for my creative mind. Negotiating the steps lead me to small door openings. From here, watch your steps. There were a lot of visible blood stain marks, cut feathers and meat offered to Goddess Kali. The view from the durbar square is unimaginable. One can go far and away to see what land can be viewed. There was a faint view of Ganesh Himalaya and Annapurna which made the trek going here so worthwhile. Little by little, as i explore the vast compound, i try to re-create what life must have been ages ago. Looking over his kingdom, the ruler must have an excellent command of the surroundings. It is very peaceful to roam around, and i found that going to the durbar square is such an experience of a lifetime. Although it's a bit sad that i can't enter to some places because only Hindus and Brahmans can, still, the fact that i am stepping on the cobbled steps, drenched in chicken and goat blood, paying tribute to the once fabled kingdom, was more than enough reason for me to actually be here. The trip to Gorkha Durbar Square surpassed my expectations in a whole different level. After coming from disappointing Chitwan, Gorkha was the place i was looking for --historical, tranquil, memorable. Dare i say, if there's one durbar you have to visit in Nepal, it is Gorkha Durbar Square. Take my word for it. As we sped down the chilling road back to bazaar, i shot a video of myself as the cool Gorkha wind blow its breeze on my face. This is the magic of Nepal. Oh, and i didn't pay to get in --just like the locals.